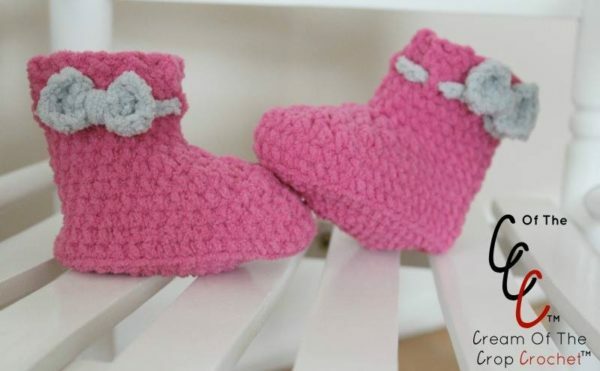 These adorable baby booties by Cream Of The Crop Crochet are designed with a newborn baby girl in mind. The cute little bow on the string adds a nice touch for the baby girls. With that said, the simple stitch pattern is also perfect for baby boys. Simply omit the little bow, or use another applique that is more suitable for the boys if you like. The booties are nice and cozy, making them great for the cold winters to keep the tiny feet nice and cozy. They are the perfect companion for this crochet teddy bear amigurumi, this baby hat or this lovey. This pattern is for newborns. This pattern works best with Red Heart, Cutie Pie yarn. ALWAYS start in the first stitch as chain. If you have any problems at all, please contact Cream Of The Crop Crochet™. We will be happy to help! Wrap yarn around the middle of the bow tightly and tie both ends together. Attach the bow to the booties over the weaved chain with CB and a yarn needle.